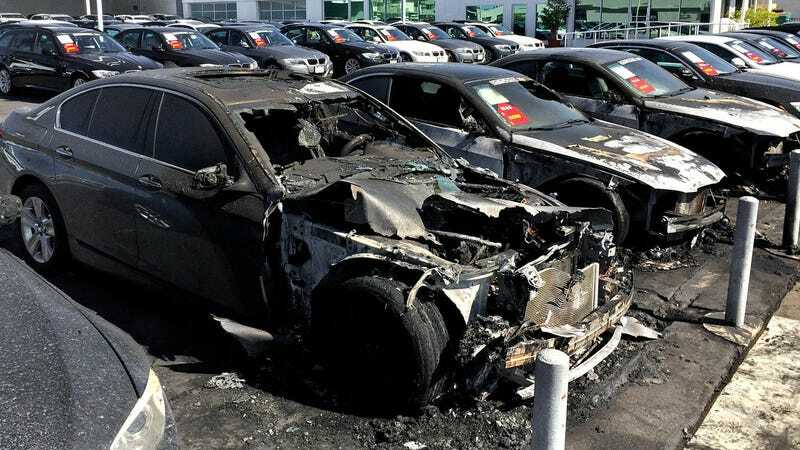 Police are searching for a man that witnesses say set fire to several BMWs at a Santa Monica dealership late Wednesday night. The blaze is estimated to have caused $250,000 in damages. Authorities have released surveillance images of the suspect and are requesting assistance. Local news channel KTLA-5 reports that witnesses saw an arsonist pour some kind of liquid onto the vehicles and set them on fire with a "Molotov cocktail-type device." Shortly after, the man fled from the scene. They described the man as wearing a hoodie and a large jacket. The fire department was called to the scene at 10:40pm Wednesday night to find three cars involved in the blaze. After the fire was contained, authorities said that four used vehicles were destroyed and one was partially damaged. Surveillance images from the nearby gas-station show someone, who according to police, is a "possible suspect." The man allegedly purchased $4 worth of gas from a station two blocks away from the dealership about 20 minutes before the fire was set...The red gas can the man was carrying allegedly matched the description of a gas can found at the dealership. Blurry surveillance video from the dealership showed a man pouring liquid from a red can onto the vehicles. Police say that other small fires were reported at the dealership, but they are unsure if the fires are related. Anyone with information was urged to call police at 310-458-8491.